Cope takes the opening frame with 96, he has a good start. In the tenth frame, Williams steals the frame. Cope should win the frame but a fluked red helps Williams to get this key frame. Williams holds a 11-2 lead before mid-session. After mid-session, Williams even enlarges his lead to 12-2 with 106, 109. He is only one frame away from victory. Cope secures to stay into the match by winning the last two frames of the session. Williams looks absolutely determinating through out the match. The match is dragged to the last session which will be played tonight. 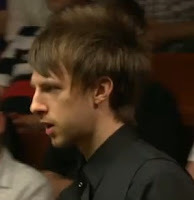 Mark Williams leads 12-4 against Jamie Cope. Haircut 100 leads Pinner Potter 5-3 before second session begins. Each of them has a good beginning. Trump hits a 108 in the second frame, 69 while Gould knocks 76, 72. Each of them takes two frames before interval. Trump leads 7-5. A great match so far with great breaks. Drama is going on in the 13th frame. Martin Gould should have won the frame but he left a chance for Trump to force a black respot. Once again Gould makes a mistake to leave black over left corner pocket and Trump pots it. Trump takes the big frame and extends his lead to three frames differences for the first time. 8-5. 61, 67, 84 put him forward to lead 11-5 over Martin Gould at the end of session. Judd Trump leads Martin Gould 11-5 and needs two more to enter quarter-final. In the previous round, both players won in the decider. Allen's comeback to win 10-9 from 9-6 down is amazing. Hawkins's victory over Stephen Maguire is also brilliant. Allen and Hawkins go 2-2 before mid session. Hawkins steals the fifth frame from Allen, once again 3-2 ahead. Allen levels the match 3-3. Barry Hawkins takes the last two frames of the session, leads 5-3 against Mark Allen. It is expected a short session. In fact, Williams just used 17 minutes to beat Cope in this session. The 13-4 victory over Jamie Cope is great for Williams because he reaches the quarter final of World Championship for the first time since 2006. Mark Williams will play Barry Hawkins/Mark Allen in the quarter-final. It is the second session of their match. In the morning session, Graeme Dott took last four frames in a row and leads Carter 5-3. At the beginning, Dotty leads Carter 6-4 by winning a very tight frame. Carter then starts his fightback, levels the match with 86 before mid session. Back-to-back centuries for the Captain, 112 and 115 put him 8-6 ahead the Pocket Dynamo. Dott doesn not give up, pulls 66 and 70 to level the match under great pressure. It ends the mid session 8-8. Carter is much more improved. A great and enjoyable session.